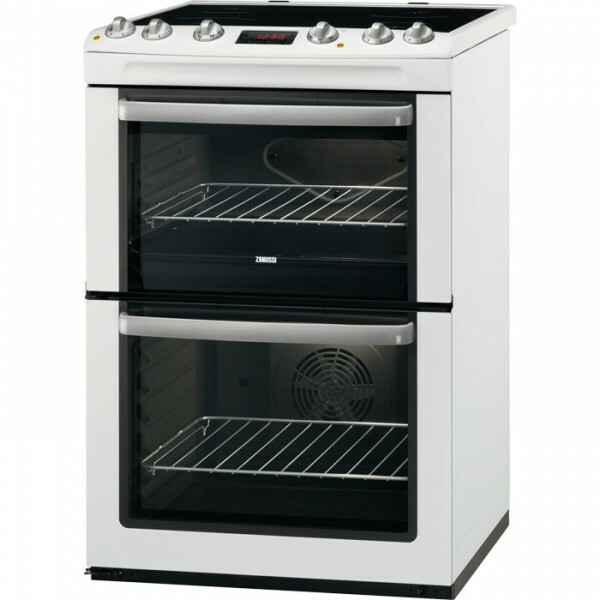 Product information "Zanussi ZCV554MW Cooker Double Oven Ceramic 55cm"
The Zanussi ZCV554MW cooker is a stylish appliance that suits both traditional and modern kitchens. This freestanding double oven cooker offers lots of flexibility, letting you whip up a wide range of tasty meals for the whole family. A spacious 73.9 litre bottom oven is accompanied by a generous 36.9 litre top oven. Both ovens are controlled independently, so you can cook two different meals or dishes at once. Invite all the family round and the ZCV554MW will provide food for everyone. Choose from six different cooking functions to whip up the perfect meal, including Defrosting, Grilling, Baking, Roasting, Browning and Boiling. The four cooking elements on the hob are controlled individually and there is enough space to have four pans on the go at once. Ceramic hobs are excellent at providing quick, even heat with little waste. They also save you time as they are much easier to keep clean than conventional hobs, with easy wipe surfaces. With two ovens and four cooking zones on the hob, the ZCV554MW lets you multitask like never before. Zanussi have been making cooking appliances for almost 100 years and have an impressive heritage. They combine a focus on ease-of-use and high standards with Italian style and flair. This results in appliances that perform well and look great – perfect for any kitchen. They have also catered to the environmentally conscious, as the ZCV554MW cooker has been awarded an A grade energy efficiency rating. Not only does this lower you carbon footprint, but it can also save you money, reducing the impact the appliance has on your bills. Related links to "Zanussi ZCV554MW Cooker Double Oven Ceramic 55cm"
Customer review for "Zanussi ZCV554MW Cooker Double Oven Ceramic 55cm"